KidznSnow :: Tip - Wagons Ho! Pack your stuff in a little red wagon. Who needs to go the gym after a weekend of schlepping kid's winter equipment around? How many pairs of skis, boots, poles, backpacks and lunch bags can you carry? Ahhh - the joys of parenting on the slopes. Here's a solution for those who just can't take it anymore. Enter the wagon. Yup - the old fashioned red wagon has made its way to the slopes. 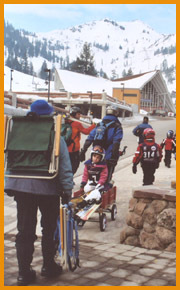 Load it in the back of the SUV - unload in the parking lot and load it with toddlers, ski boots, skis, backpacks, picnic lunch - you name it. Savvy parents take along a cable lock and find an unobtrusive spot to lock the wagon at the lodge. Be sure to ask a security guard or other "info" person before you leave the wagon locked in the middle of the promenade or other central location. Then at the end of the day, load up and head to the car. So simple!